Create an output shaft for a shifting gearbox from a drawing. Use extrudes to create base geometry of shaft, starting from largest hex in center. 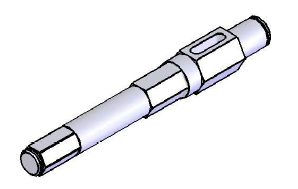 Use extrudes and chamfers to create snapring grooves on either end of the shaft. Use extrude cuts to create slot & hole in shaft.